RME have ploughed all of their considerable interface-making know-how into the Fireface UFX+, and the results are impressive. RME are enjoying well-deserved 20th birthday celebrations this year, and it’s not hard to identify the factors that have made their audio interfaces so successful. From their proprietary SteadyClock clock-regeneration circuitry, to the use of field-programmable gate arrays rather than off-the-shelf DSP and controller chips, to enabling multitrack recording on iPads, RME have repeatedly been first to market with products that exploit new technologies and connection protocols. At the same time, however, their continuing support for older products is second to none. Whereas other manufacturers have allowed themselves to become dependent on third-party driver code, sometimes with unfortunate consequences for latency and stability, RME have always focused on coding their own rock-solid and lightning-fast drivers. And, one might add, RME have always treated their customers as intelligent adults who need to get things done, not as consumers buying into a brand economy. In short, RME products might not be as cool as some other audio interfaces, and they make no pretence of emulating vintage studio hardware or adding character to your music — but ask most people in the business what gear they’d trust in a life-or-career-death situation, and RME would be pretty high up the list. The latest entry into their range is the Fireface UFX+ and, in many ways, it’s an appropriate product with which to celebrate RME’s birthday. As the new flagship of their range, it brings together many of the technologies they’ve created; and, as we’ll see, it also marks one or two firsts for the German manufacturers. The UFX+ quite possibly sets some sort of record for a 1U audio interface by featuring an astonishing 94 possible inputs and outputs. No, that’s not a misprint: it really is possible to record and play back 94 channels of audio simultaneously, at least at base sample rates. 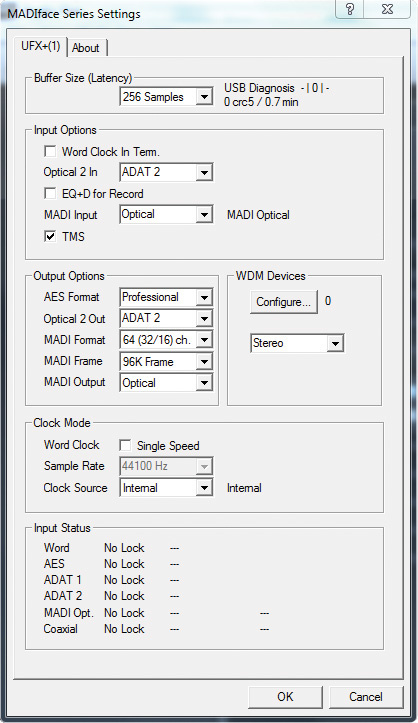 In proportion, these are broken down as follows: Up to 64 digital inputs and outputs can be accommodated using the MADI protocol, which RME have been championing for quite a few years now. Both coaxial and optical MADI sockets are fitted, while two further pairs of optical sockets usher in and out up to 16 channels of ADAT-format digital audio. There are 12 analogue inputs — eight at line level and four with optional mic/instrument preamps — and the same number of analogue outputs, including two pairs of headphone jacks. And, finally, there’s an AES3 digital input and output on XLR. In the non-audio domain, meanwhile, the UFX+ features dual MIDI in and out and a socket for the optional Advanced Remote Control, while the coaxial MADI connectors can also double as word-clock in and out. Pleasingly, RME have also found space to include a built-in mains transformer with an IEC socket, which will accept any mains voltage from 100 to 240V. All this I/O is sensibly distributed between the front and rear panels, with the former hosting combo XLR/jack sockets for the four inputs that have preamps, one of the two MIDI ins and outs, and both headphone sockets, along with a USB port labelled Memory, of which more presently. The right-hand side of the front panel is devoted to user control and feedback. Two small rotary encoders handle headphone volume, while a larger third one can take various roles but defaults to behaving as a main monitor level control. Between these you’ll find four small buttons and a very detailed but very small colour display, devoted mostly to metering. There’s no space wasted on the Fireface UFX+’s back panel, which manages to squeeze in plenty of analogue and digital ins and outs alongside the Thunderbolt and USB 3 ports. Things are no less impressive inside the box, either. Internally, the UFX+ boasts a digital mixer with an eye-watering 4096 channels. Processing on tap includes global reverb and delay, and EQ and dynamics which can be applied to individual channels. This mixer can be edited from the connected computer using RME’s TotalMix FX utility, or from the iPad app of the same name. On the subject of computer connections, one thing is definitely new about the UFX+: it represents RME’s first foray into the world of Thunderbolt. Users have a choice of connecting either via this protocol, by USB 3, or, with reduced I/O count, over USB 2. In past reviews, I’ve criticised other manufacturers for not supplying Thunderbolt cables with Thunderbolt interfaces. RME too give you only a USB cable (USB 3 rather than USB 2), but for reasons explained in the ‘Latency & The UFX+’ box, I actually think this is fair enough in this case. Drivers for USB and Thunderbolt are downloaded and installed separately, and the UFX+ will also act as a class-compliant device, making it possible to record multitrack audio to an iPad. Connecting the UFX+ over USB 2 rather than USB 3 means you can’t directly record from or play back over MADI, as there simply isn’t the bandwidth to do so, though MADI signals can still be routed within the internal mixer. Some manufacturers develop new control-panel software for every new connection protocol that arises, or provide different utilities for large and small interfaces. 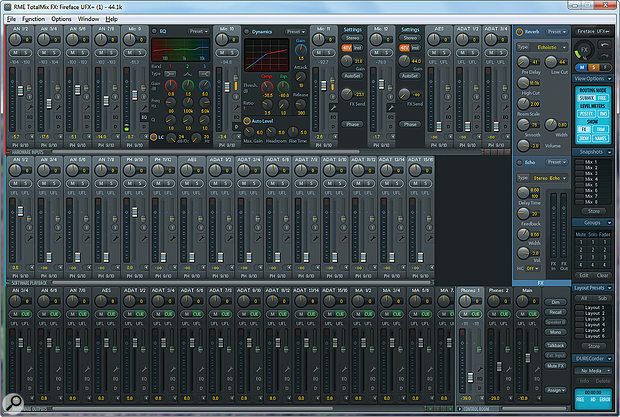 RME, however, bundle all their interfaces with a single, scaleable utility called TotalMix FX+. One plus point of this approach is that TotalMix is by now a mature program that has had its rough edges ironed out though years of development. This is an advantage which should not be underestimated: most of the other USB 3 or Thunderbolt interfaces I’ve tried have come with newly developed control panel utilities, which vary quite drastically in usability. However, there remains the brute fact that, on the UFX+, TotalMix presents 4096 mixer channels, as well as DURec recording (see box) and many configuration options. As such, it’s likely to prove pretty intimidating to the new user. Although, in general, I found TotalMix easier to get along with than counterparts such as the HTML mixer page provided with MOTU’s AVB interfaces, I do wonder whether RME might follow MOTU’s example in supplying a few global presets that configure the UFX+ for commonly used roles. As it is, if you want to use TotalMix, you pretty much have to set it up from scratch yourself. If you don’t want to use it, incidentally, there are a couple of alternatives. One is to take advantage of the UFX+’s good low-latency performance by disabling TotalMix and performing all your routing and cue mixing within the DAW software you’re using. Another, if you’re using a DAW that supports the ASIO Direct Monitoring protocol, is to control the UFX+’s internal mixer that way. RME claim to offer the most complete implementation of ASIO Direct Monitoring on the market, making this an attractive choice for users of Cubase, Reaper, Studio One and other compatible programs. If you do choose to use TotalMix, you’ll find it gives you two complementary perspectives on the UFX+’s built-in mixing features. These are called Mixer view and Matrix view. Rather than presenting a single mixer page where each channel has an implausible number of aux sends, Mixer view in effect provides a separate mixer for each output pair. Three rows of channels are displayed, with hardware inputs at the top, software playback channels in the centre and hardware outputs at the bottom. In the default mode, what you see in the top two rows corresponds to the mixer feeding one output pair: select a different output in the lower row and you’ll see that output’s mix instead. Input channels have buttons that open little sub-panes for setting up EQ, dynamics and preamp configuration (where applicable). These settings are, naturally enough, global for a given input — so if, for example, you apply a low cut on input 1, it will be heard on input channel 1 in every output. Likewise, channel names are global, and although each channel has its own effects send fader to feed the built-in reverb and delay, there can of course be only one actual level at which each input signal is sent to those effects. And if you want a particular input’s fader to act globally across all its routings, that’s possible too, by enabling the Trim mode. It’s possible to override the default settings and ‘mix and match’ channels from different outputs’ mixers within a single Mixer view pane, though this strikes me as potentially rather dangerous, because the only visual identification that tells you whether a channel is feeding outputs 1-2, 3-4 or whatever is a small text label. In fact, if I could make one improvement to TotalMix FX, it would be to make it possible to apply different colour schemes to different mixers. As it is, it is quite easy to accidentally click on an output channel and switch the whole mixer over, and visual feedback when you do so is subtle. Talking of output channels, two stereo outputs can be nominated Main Outputs A and B, and these, along with any designated Phones outputs, form a special Control Room section of the output row that is always visible. Control Room outputs gain a number of useful features such as dim and effects muting. It’s also possible to set up both talkback and listenback, though to make much use of them, you’ll need some form of hardware control. This could be RME’s own Advanced Remote Control, but since TotalMix is also fully controllable using MIDI and OSC, there are plenty of other options that can be pressed into service too. The alternative way of visualising the UFX+’s gargantuan channel count within TotalMix FX is Matrix view. The manual describes this as being like a patchbay, and what you see is a gigantic grid, with hardware inputs and software playback channels down the Y axis and hardware outputs along the X axis. Thankfully, there are no Reason-style virtual patchbay cables: to connect an input to an output, you simply click in the relevant cell in the grid. The connections you make this way are not simply binary, either. By clicking and dragging, you can change the level at which the input is passed to the output — in other words, its fader level within the Mixer view. So, although there are plenty of Mixer-view features that are not available here, such as the ability to control preamp settings and configure EQ and dynamics, it is actually possible to perform basic mixing in the Matrix view. In fact, in any situation where you need to set up and adjusting multiple simultaneous mixes, this might well be the easiest way to do it. The Fireface UFX+’s Settings screen in Windows.In this brief outline I’ve only really scratched the surface of what’s possible with TotalMix FX. There is shedloads of more advanced functionality on tap, and it would take an entire issue of SOS to cover it in full. For example, the complex heirarchical preset structure begins with Workspaces, which store complete TotalMix configurations. Each Workspace can contain multiple Layouts, which store the visual configuration of TotalMix but no audio settings, and up to eight Snapshots, which store fader, pan, EQ and so on, but no layout information; and at the next level down, there are yet more specific preset types such as settings for the EQ and dynamics panes. Since it’s possible to show and hide channels to create custom Layouts, this makes it possible to set up a number of different views that are narrowly focused on separate aspects of a mix. Oh, and did I mention that TotalMix also supports up to four each of fader, mute and solo groups? Or the fact that M-S decoding is available as a channel processor? Or the Cue bus, which lets you instantly switch any other output into the main output path, allowing the engineer in the control room to temporarily call up each monitor mix on his or her studio speakers? TotalMix has been described as matching many DAW programs in terms of sophistication, flexibility and depth, and I think that’s an apt comparison. In fact, in its sheer comprehensiveness, it reminds me a little of Magix’s Samplitude; and, like Samplitude, it doesn’t offer too many concessions to the casual user. An awful lot of thought has gone into making TotalMix the way it is, and it really does cater to every conceivable role to which you might put an interface like the UFX+ — but expect to put some effort into learning how to use it. This process is made less painful by RME’s documentation, which is generally clear, goes into plenty of detail and comes in the form of a spiral-bound printed manual (in English and German) as well as a PDF. In use, one of the first things that strikes you about the Fireface UFX+ is the attention to detail that has gone into its design. For instance, in every DAW I tried, all of its inputs and outputs showed up correctly named and in the right order, and the input and output latency were reported correctly with single-sample accuracy. Should you happen to disconnect the UFX+, the TotalMix FX window remains open and editable, and you get the option to upload any changes into the device on reconnecting. When used with MADI devices, you have the option of connecting these simultaneously by coaxial and optical cables; if the optical connection is lost, the UFX+ will automatically switch to the coaxial connection without dropping any data. And so on. Something else that’s immediately apparent is the UFX+’s clean and crisp sound quality. The published specifications are very good, if not quite state-of-the-art, with an A-weighted dynamic range of 118dB on the analogue inputs and outputs. The UFX+ also has noticeably better mic preamps than previous RME interfaces I’ve tried; offering a huge 75dB gain range, these are in a similar league to those provided on the Apogee Ensemble Thunderbolt. The headphone amps are equally beefy, and monitor control is smooth and glitch-free. Perhaps the only obvious area where it loses out to some rivals is in the petite dimensions of its hardware meters, but I imagine most of us do most of our metering in software these days in any case. In short, if the UFX+ meets your needs, it’s very hard to think of a reason why you wouldn’t buy one. That said, I do occasionally find myself wondering whose needs are met by this type of interface. Like all the products in the Fireface range, and indeed like rivals such as the MOTU 1248 or Focusrite Red 4Pre, the UFX+ offers a smorgasbord of different I/O types. On the one hand, this means they can be Swiss Army knives to the jobbing audio engineer, able to connect with almost anything that comes your way. On the other, however, it means that most users will be paying for at least some I/O they’re not going to be using, while needing to add extra preamps, analogue I/O or monitor control hardware. For example, the UFX+’s rock-solid drivers and the ability to make backup recordings using DURec will be big selling points for anyone doing location work; yet it’s a rare location project that needs only four mic preamps. In the studio, meanwhile, the UFX+’s superb low-latency performance is a big plus point — but again, you’d need to complement it with expanders and a remote control, or a mixing desk, so it might be more appropriate to go for an interface that just offers lots of line-level I/O, or a purely digital interface (which, of course, RME do make). It’s also interesting to note that whereas Focusrite and MOTU are incorporating networked audio technologies into their interfaces as the main means of expansion, RME have stayed faithful to MADI. Whether this is because they see no advantage in AVB and Dante, or whether they’re simply waiting it out to see which of the rival formats comes out on top, I don’t know; but it’s another thing to consider when making your choice. None of us can be certain where the future is headed, but if you judge companies by their track record, then RME have been right more often than most. They also have an admirable history of supporting everything they make well into its twilight years and beyond, which is not something you can say of all interface manufacturers. When you’re spending upwards of £2000$2500 on a product, you hope and expect to still be using it in five years’ time, perhaps 10. There used to be a saying in the world of business computing that no-one ever got fired for buying IBM. In the world of music computing, that role falls to RME, and the Fireface UFX+ is about as safe a bet as you can make. Most of RME’s rackmounting and half-rack interfaces will happily function without a computer attached, allowing them to be pressed into service as stand-alone preamps and digital mixers where needed. The original Fireface UFX, launched back in 2011, took this idea a step further by incorporating the ability to record audio directly to a USB drive attached to the front-panel Memory port. This functionality could be used either to capture audio without a computer connected, or to create an independent safety copy of audio being simultaneously recorded to an attached Mac or PC. Dubbed DURec for ‘Direct USB Recording’, it has been considerably enhanced in the UFX+. RME say that the direct recording is now more reliable than before, and compatible with a wider range of hard disks and pen drives. It also supports higher channel counts, with simultaneous recording of up to 76 inputs now possible. Naturally, it’s also possible to play back massively multichannel recordings, so in a context where the UFX+ is being used with a MADI-equipped live sound desk, DURec could serve both as a means of archiving each night’s show, and as a source of multitrack audio for virtual soundchecks. 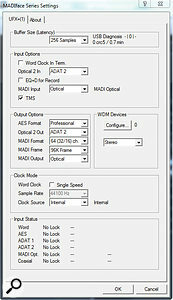 Alternatively, as its operation is independent of the attached computer, it can serve as a useful redundant recording system. To configure DURec, TotalMix FX must be switched to Record View. In this view, the Mute and Cue (solo) buttons on all the hardware input and output buttons are replaced by conventional triangular Play and circular Record icons. These are used to choose which channels should be recorded, and which should be destinations for DURec playback. DURec activity is also displayed on the unit’s own front-panel display. It’s perhaps a shame that software playback channels in TotalMix can’t be recorded, but I suppose this makes sense, given that DURec is designed to be used without the computer attached if necessary. An interesting and thoughtful decision on RME’s part concerns the format in which DURec recordings are written to the attached drive. Rather than having every input generate its own mono WAV file, the UFX+ writes a single, interleaved 24-bit WAV, named ‘UFX_01_00.wav’ and containing as many channels as there are record-enabled inputs. If you enable a lot of inputs for recording, the 2GB upper limit on the size of a single WAV file is thus reached fairly quickly, at which point the UFX+ begins to write another with the name ‘UFX_01_01.wav’, and so on. 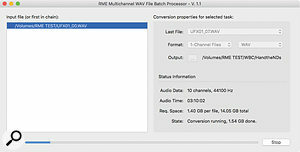 The Multichannel WAV File Batch Processor does exactly what it says on the tin.When you come to mix the resulting recording in a DAW, you’ll require some way of stitching these recordings back together and extracting all the individual channels as separate files, something not easily accomplished in all DAWs. 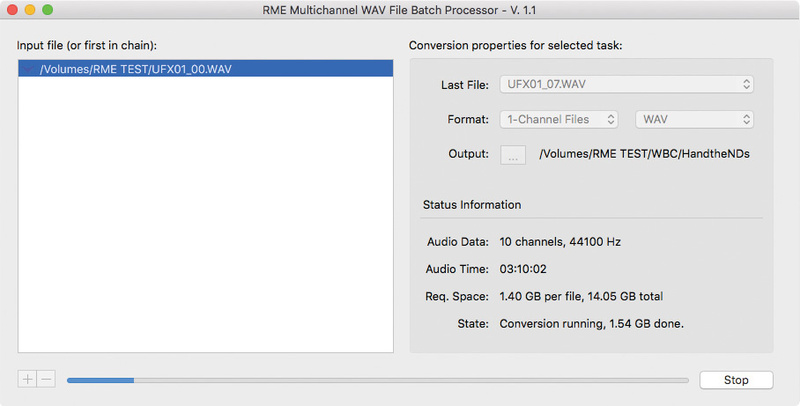 RME’s solution is a software utility called ‘Multichannel WAV File Batch Processor’, available for Mac and PC, and downloaded for free from their web site. This takes a series of multi-channel WAVs recorded using DURec, joins them all together and spits out the individual channels as full-length WAV files. Although the need to ‘stitch and split’ adds an extra stage of complication, and takes quite a while if there’s a lot of data involved, I think that overall this is a very sensible approach. It ensures that there’s no way for individual channels to become out of sync, it makes it very hard to accidentally miss out a vital track when copying files, and it doesn’t clutter up your drive with a million cryptically named audio files. And, let’s face it, there’s always quite a bit of preparation involved in getting a concert recording ready to mix, so the extra work isn’t that much of a burden in the scheme of things. It is, however, a shame that the split files don’t inherit the names of the TotalMix mixer channels from which they were recorded, and that the choice of mono or stereo is global rather than per-channel. Back in the day, achieving good low-latency performance usually meant installing a PCI-based soundcard. When manufacturers began to develop Firewire and USB audio interfaces, they all too often relied on third-party controller chips that were not optimised for fast, reliable audio transfer, and generic driver code that has achieved only mediocre performance. As a result, users found themselves burdened by high CPU loads, compatibility issues and audible monitoring delays that simply couldn’t be got rid of. RME were one of the few exceptions: by developing their own controllers and code, they not only avoided most of the compatibility problems that plagued rival interfaces, but showed that Firewire and USB 2 can deliver audio performance very close to what’s possible with PCI cards. Unfortunately, the same issues are still being played out today, this time with Thunderbolt cast in the role of the good guy. The Thunderbolt protocol is, to most intents and purposes, an externalised version of PCI, and so far, every Thunderbolt interface I’ve tested has yielded excellent low-latency performance. Things have not, however, been so rosy in the world of USB 3, where, once again, some manufacturers have made themselves beholden to third-party chipset and driver developers, with less than impressive results. And once again, RME have taken it upon themselves to show that the fault does not lie with the protocol, but with the implementation. As a result, what’s really impressive about the UFX+ is not so much that it performs well when connected via Thunderbolt, because so do most other Thunderbolt interfaces. It’s that it can match this performance when connected via USB 3. On my MacBook Air, Reaper reported a round-trip latency of 3.5ms at 44.1kHz with the smallest 32-sample buffer size selected under Thunderbolt. Reconnecting the UFX+ with the supplied USB 3 cable produced exactly the same measurement. And, in both cases, a loopback test showed that the reported latency was accurate to within a single sample, something which can’t be said even for most other Thunderbolt interfaces. What’s more, CPU load was low enough that the UFX+ was perfectly usable at this setting, whichever connection I chose. My Windows machine is too old to have Thunderbolt, but the UFX+ worked fine over USB. Oblique Audio’s RTL Utility measured the round-trip latency as being 3.2ms at 44.1kHz with the smallest 32-sample buffer size; and though I wasn’t able to use DAW software at this setting on such an elderly PC, I’ve no doubt it should be possible on more modern systems. So, exceptionally, I don’t feel I can lambast RME for not supplying a Thunderbolt cable, as there is actually no reason not to use the UFX+ over USB. RME say it’s even possible to connect up to three units to a single computer using either protocol — even though another manufacturer told me categorically that USB 3 does not support the connection of multiple interfaces! Shows that low-latency performance over USB can match Thunderbolt. Excellent sound quality, with RME’s best mic preamps yet. Offers stand-alone or redundant recording of up to 74 tracks to USB media. Incredibly powerful built-in mixing functionality. With only four mic preamps and 12 analogue inputs, taking full advantage of its capabilities means investing in I/O expansion and a remote control. Although it’s never needlessly complex, it’s still complex! The new flagship of RME’s range exemplifies all the qualities we’ve come to expect from the German manufacturers: excellent low-latency performance, pristine sound quality and immensely flexible built-in mixing and processing. However, making the most of this potential will require additional hardware for expansion, and some effort from the user.